Pros: It is important to know that the software is hosted, which means that it is accessible everywhere and on any devices. You can download and use the desktop clients on your PC or if you prefer to access it on your phone, the app is available for downloading as well. You can also use the synchronization function if you want the files on your PC to appear automatically in your OwnCloud account. And finally, what I really like about this software s that I don't suffer sending large files via email, I just upload them in OwnCloud and share with whoever I want them to receive. You will be surprised to discover very convenient software where you can store your files and share it easily with your friends or colleagues. OwnCloud is mainly used by small and medium companies to store their documents and share them with clients. By the way, you can use the software not only for your business purposes but also for your own personal needs. You can upload your videos, music, books or other files of large size. Cons: On the one hand, the sync feature makes everything easy and fast but on the other hand, if you accidentally delete a file it may disappear from everywhere with no chance to restore it. The time for loading and showing pictures and files is too long. In addition, it is impossible to watch videos. 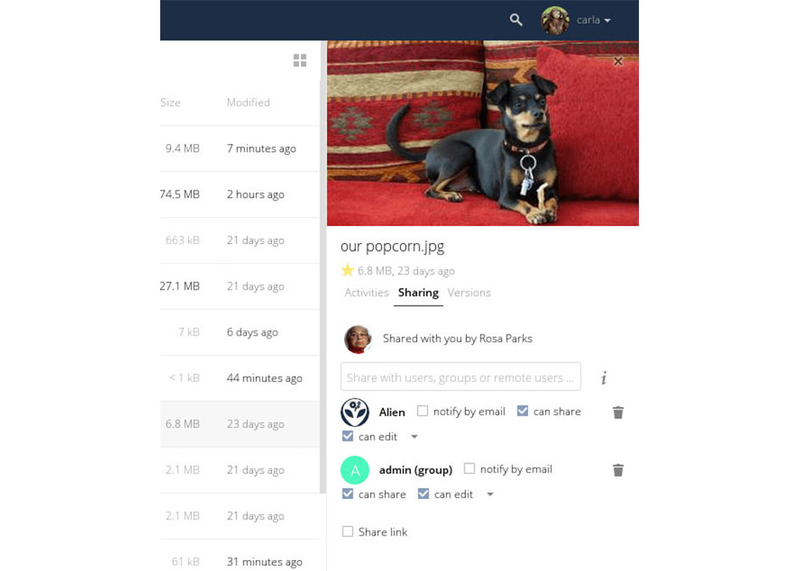 OwnCloud is storage, you can only store them but I wish I could also watch them. Working with the calendar and contacts is not easy. You need to add some plugins to share them via emails. Overall: I highly recommend this platform to all enterprises which are looking for a good solution to their document storage. The platform security is ensured: your files are protected by the username and password created by you. So, I advise you to give it a try and find your long-term storage solution. Pros: It has phenomenal capacities which encourages me keep my work all together, with my associates, I can synchronize every one of the records on various PCs, it's super sheltered since I can encode the documents, has online music peruser, online content tool, watcher of online archives (PDF, OpenDocument), among numerous different capacities. Cons: The confounded method to coordinate different advances like FTP. The documentation for the execution of different techniques like FTP is somewhat confounded in comparisson with different instructional exercises. Overall: Having the capacity to get to every one of my documents from anyplace is incredible. I have a few terabytes of documents on my server, more than I would ever store with any of the cloud suppliers out there, in any event not at a sensible cost. When it is set up and designed it is entirely strong and does the activity I require it to do. Pros: This software makes it very easy and RELIABLE to share files with our clients and others. It offers a very easy to use interface and has NEVER failed to upload or download. Prior to getting this tool, we struggled with method for sharing (especially large) files with our clients. 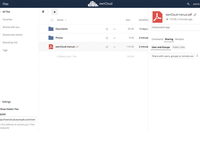 Once our IT dept got a hold of ownCloud and customized it for our use, my life got measurably easier. Cons: The only issue I have ever had with it is when I was surprised by a site expiring. Now, I know it was my fault to set a date and then forget it...but it would be nice to receive a notice when an expiration date is nearing. I have learned how to manage that better, but would still appreciate a notification. Overall: We frequently have to share very large files (zip files, videos, etc.) with our clients for their approvals. This process was always complicated and we employed a number of solutions over the years. 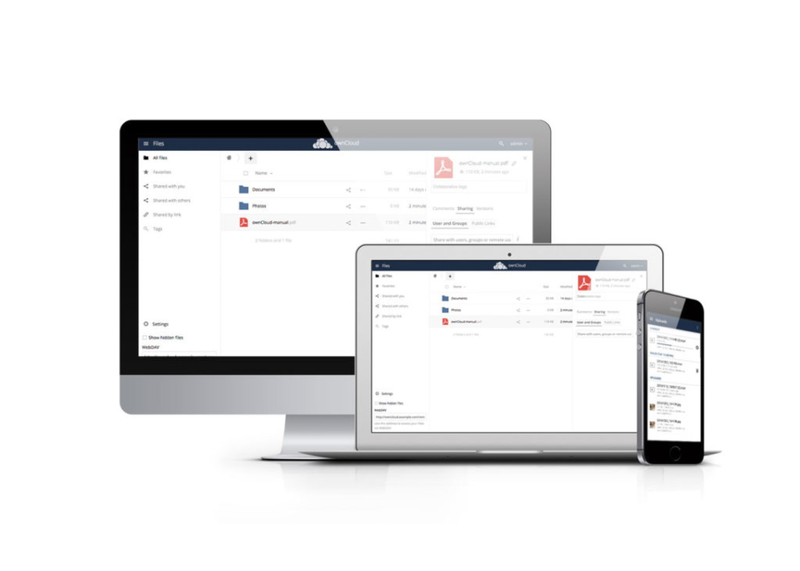 None has been as easy to use and as reliable as ownCloud. It has literally made my life easier. I am able to organize files into folders with separate passwords and urls allowing me to share only what is needed to specific people. I know that my clients will be able to access and download what they need, when they need it. That gives me great piece of mind. Pioneer on open source cloud storage. Pros: I been using owncloud for at least 10 years. I'm part of the translation to spanish too. I got mad at bugs, problems, etc, but this growed quick and bugs were repaired. Now, is the solution that I use internal in the institution (government) and for my personal customers, for backup. The big pro is that the space its what you can afford in hard drives. Easy to maintain. Secure. With a lot of addons for productivity and integration. Clients for every single OS that exist. Cons: As same as dropbox and other products, the big con that I found is that every time that the client starts needs to scan all folders. In big folders with a lot of files, this take a while and it use a lot of hard drive. So when your OS starts client will kill the HD until finishing the indexing of files. Overall: I love owncloud, i been there almost since it born, and I'm using it now, actively participating in the community. Pros: Keep your files onsite. you don't have to relinquish control of your files to some cloud provider to enjoy the sync and sharing privileges that they offer you can run your own cloud. This is a storage platform that stores your files like Dropbox and sync's them with your computer or computers . They have clients for Linux, Mac , Windows, Android and iOS. There is a free version but also there is a paid enterprise version with expanded features. There is also a growing market place of apps that you can install on your instance to expand functionality even further. Cons: Can be a little complicated to setup initially. Not all features are available in the free/open source version. Overall: While I ultimately decided to go with Nextcloud over this one they both work really well and if the idea of an enterprise version appeals to you for business reasons then this is the way to go. Own cloud functions well and does a fantastic job of syncing files between my computers and MY cloud. Cons: The cache configuration can be complicated to configure. Cons: Being an Open Source, you can find information on the network, and in this way it can be violated by knowing how it is installed and configured. Pros: Having my files on a server I control is a significant benefit. The user interface makes sharing files easy, with shares including an optional expiry date. Cons: Installation and updates take some knowledge of Linux systems, and troubleshooting gets very technical quickly. This should be expected, since you are running a powerful server. Overall: Saving fines onto our own hardware allows for flexibility while maintaining control over the full software stack. 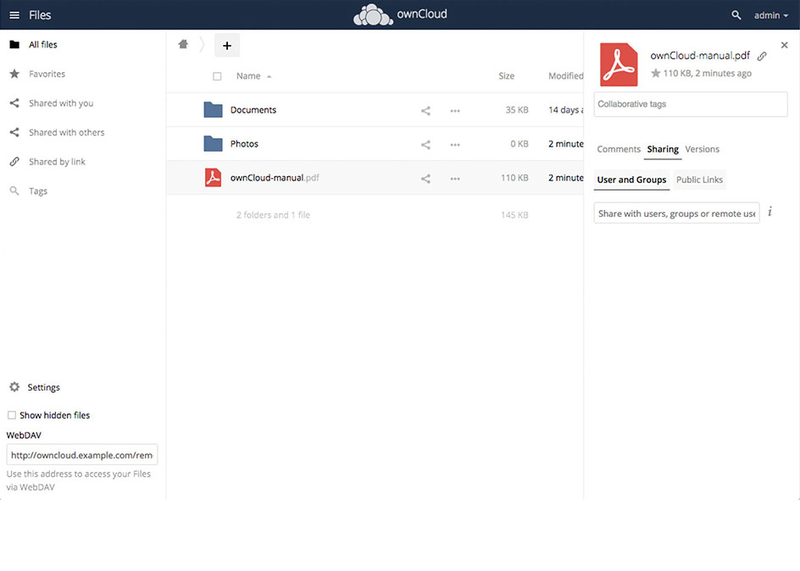 Pros: owncloud is a well known and stable tool for sharing files. But beside sharing files it´s also an calender-server a, contact-server and if needed a gallery. Owncloud offers a lot of plugins to fit a lot of needs. Cons: Develoment slows down after the fork of nextcloud. The main focus is towards paying bussiness users. Overall: Simple tool i´m using since a long time. Stable but less inovations. Pros: What I liked most about the software is the ease of sharing and managing the files in the cloud, apart from the groups that can be created to share files in common. Cons: Within the same group you can not create policies where not all of the same group can view the files, to achieve this you have to create a different group with only the people you want to share or share individually with each one. Overall: My general experience is positive, it is a great alternative to store and share files, in my personal case I use it in the company where I work to share files by departments, I manage the cloud, create and eliminate users, create groups and apply different policies. Excellent personal storage tool for documents, files or multimedia elements. Pros: I really like the ability of this platform to be able to make it keep all the things that I want and be able to share them with a link of vesialization, providing permission, blocking files, indicating the expiration date of the link etc. I find it impressive and very easy to use. Cons: The not being able to do the implementation of the platform in a private environment since it has many limitations for that operating system. Taking into account that most people use that operating system. High availability of material for learning about the use of the platform. It is a very friendly tool. Pros: I was relatively easy to set up on the server and provides a basic file structure so that institutional users can share files and keep them organized. It also has a chat feature. Cons: While it has most of the functionality that I could want in such an app. I have struggled to actually use it since I already have my other cloud storage providers. 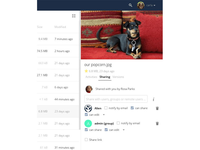 For the chat feature, I would rather reach for my phone to call, text or use the messaging function with the personal than use the company-mandated chat feature in ownCloud. Overall: I actually do not have a choice since some office environment block external cloud storage providers and migrate away from Microsoft enterprise services to ownCloud. However, only access if I really have to since there are already so many tools that I use to perform these functions.